You all have heard about the Skagit Valley Tulip Festival right? While the tulips are our most famous blooms, there’s nothing quite as wonderful as entire fields of bright, cheery daffodils against our Mt. Baker backdrop. The La Conner Daffodil Festival celebrates spring and daffodils! It’s just so beautiful in March with the Daffodils blooming and there are so many fun events and exhibits in La Conner during the month of March. If you can’t make it to Skagit Valley Tulip Festival in April, join us in March for the La Conner Daffodil Festival! To get you started, we will be posting the Daffodil Bloom Map as soon as it’s ready to go! The Daffodil Bloom Map is updated daily to show you which fields are blooming. Join us in La Conner among the daffodil fields for a dashing bicycle ride with a bit of style. It’s a perfect place to be planted and a beautiful place to bloom. Tally-ho! What is a tweed ride you may wonder! A tweed ride is a return to a bygone era in England when families would dress in their best clothing, assemble a picnic lunch, get on the train with their bicycles and go out to the countryside. Riding their bicycles home. What would be better than a group ride among fields of daffodils in which the cyclists dress in classic tweed or any smart looking outfit. Any effort made to recreate the spirit of yesteryear is also always appreciated. Any and all bicycles are acceptable on the Tweed Ride. Its a smashing way to throw a party for all our cycling friends to celebrate the arrival of Spring. Riders should expect a scenic route enjoyed at a slow pace, stops along the way with exceptionally evocative atmospheres, and plenty of time to socialize with other well-dressed, convivial cyclists. Please visit The Dandy Daffodil website for registration, route and itinerary. The itinerary includes an afternoon picnic and the after-party! MoNA Style – Not Tweeds, Not All Yellow, But Just As Fun! MoNA Style will feature more than 40 participating Northwest artists to demonstrate, display, and sell their artwork. From 11:30 am-1:30 pm guests will have the opportunity to enjoy lunch at one of the participating restaurants where informal modeling will show off the artists’ creations. Attendees will vote for their favorite artist to receive the People’s Choice award. The public will get a chance to win raffle baskets of prizes from local merchants. Please visit the Museum of Northwest Art (MoNA) website for more information! The La Conner Kiwanis will be celebrating their 100th Anniversary of Kiwanis – The Kiwaffodil! They will be starting the Kiwaffodil celebration on March 21st by serving pancakes at the La Conner School cafeteria for the “Splash it 4ward” event. At Maple Hall between 10am-3pm plan to see the Children’s art exhibit, activities from the Boys and Girls Club, a musical venue from our local school bands, and the Crowning of the King and Queen of Daffodils. The silent auction will be held from 10am – 7 pm to benefit the Bella and the Boys & Girls Club. The Classical Guitarist, Andre Feriante, will play from 5-8pm with Hors d’oeuvres and wine. All donations going towards helping Bella. Photographers each year get ready for the La Conner Daffodil Festival Photo Contest! All you have to do to be entered to win is take your photos during the La Conner Daffodil Festival and then post to facebook with hashtag #laconnerdaffodils. The top 10 photos will be announced and then the public votes on the winning photograph! The winner will receive a cash prize and be crowned the La Conner Daffodil Festival Official Photo. 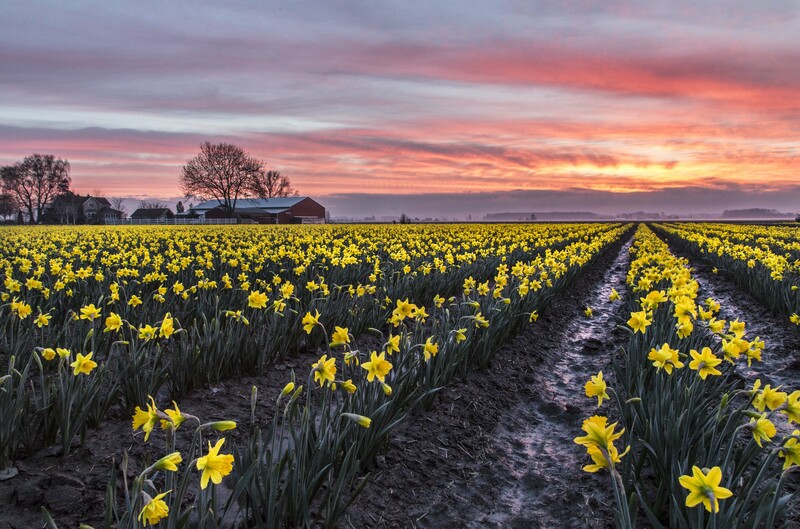 Andy Porter’s Daffodils At Sunrise was chosen as the winner of the 2014 “unofficial” Daffodil festival. Daffodils At Sunrise is the Official Photo for the 2015 La Conner Daffodil Festival. Daffodils At Sunrise was also featured internationally on Flickr’sExplore which resulted in close to 17,000 views! Plan Your La Conner Daffodil Festival Trip! Because there is so much to see and do during the Daffodil Tulip Festival, we recommend that you plan ahead and make reservations at one of La Conner’s lodging establishments. You’ll be centrally located and within a few minutes of all of the daffodil fields and display gardens, plus you’ll be able to enjoy a visit to our waterfront village, shop in our many specialty stores and dine at one of our amazing restaurants. There are not many valleys quite as beautiful as the Skagit Valley – and there certainly are even fewer valleys as gorgeous as ours is when the sun is out, the fields are ablaze with color and snow-covered Mount Baker offers a perfect backdrop. 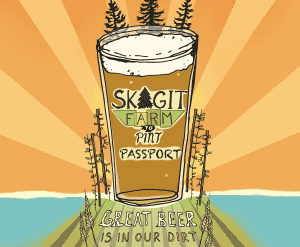 Come visit us – we promise that you’ll absolutely love La Conner and the Skagit Valley in March! P.S. … While it’s always fun to visit La Conner during the spring months – there are tons of reasons to come back again and again – all year round! Take a look at our Visit La Conner on a Return Trip page to learn more about what’s fun and engaging during each of our four seasons.